ALavandhAr is enjoying the valour, bravery etc and the beauty of emperumAn’s divine shoulders. jyAkiNa karkaSai: – As said in mudhal thiruvanthAdhi 23 “thazhumbirundha sArnga nAN thOyndhavAmangai” (the beautiful arms which have the rough marks due to rubbing with the string of the bow, sArnga), the divine shoulders which are decorated with the rough scars caused by rubbing with the bow string. Since all his shoulders have these marks, he is called savyasAchi (one who is capable of shooting with left hand also). The divine shoulders which have the scars due to destroying the enemies of his devotees. For brave shoulders, such scars of bravery are decorations. Subhai: – As said in SrIvishNu purANam 5.6.28 “… SubhEna manasA dhyAtham …” (brindhAvanam was thought upon by the auspicious mind of krishNa), his shoulders which would help voluntarily for the prosperity of his devotees, without any expectation; also explained as – [service to or vision of] the shoulders which are the goal for the devotees. chathurbhi: – Like a kalpaka tree branching out [by watering], his arms branching out, where “protection for his devotees” is the water [nourishment]. AjAnu vilambibhi: – Having arms that stretch upto the knees is purushOththama lakshaNam (identity of superior person). priyAvathamsa … – Previously, protecting his devotees was explained as his routine; here that [protecting his devotees] is explained as the reason for SrI mahAlakshmi’s embrace. The uthpala (water-lily) flower which is worn by her, her earrings, her divine bunch of hairs that spread when in contact with emperumAn – the marks which reveal the pressing of these on him and by which he is shining. 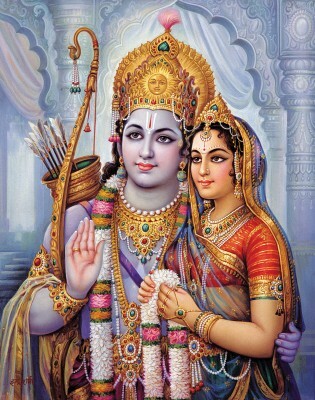 As said in SrI rAmAyaNam yudhdha kANdam 21.5 “sIthAya: Sobhitham purA” (The divine arm of SrI rAma which was in contact with sIthA [in the past] on the bed, and is shining because of that), a brave wife would only embrace the brave shoulders [of her husband]. If that is not the case [if lacking valour], it is like any normal woman’s embrace. The marks of love and the marks of valour are the auspiciousness for the divine shoulders. chakAsatham – Only such shoulders are the cause for the radiance and splendour of the divine lover named nArAyaNa. This entry was posted in Other, sthOthra rathnam on January 15, 2017 by Sarathy Thothathri.